Running a Contest Giveaway for complimentary 3 qty of 1 hour of pole fishing at Ah Hua Fishing! Hello all readers, in case you don't know, I'm running this giveaway right now till end of the month. The last "Abang" southern island night offshore fishing trip? 17 September 2011 (See here). I remembered good old Shawn of Singaporefishing.org catching a fish head and nothing more. Not sure why I didn’t go night fishing for the last 8 years but I like to tell people that night fishing was for young folks and that I wasn’t getting younger. 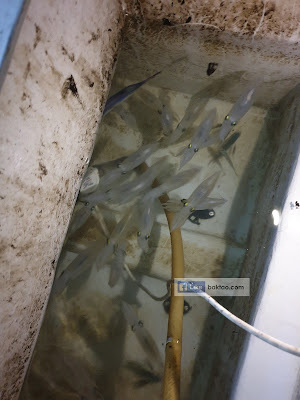 It all changed one evening as the usual kakis were dreading the heat during the day Southern Island/Tuas offshore fishing and casual conversations about the myths of 12kg golden snappers during night trips got to us. All too soon, we were gathering up our dusty gear and our old night fishing terminal tackles (rangongs, giant swivels and big sinkers up to size 24) to go on a somewhat “refresher” night offshore fishing trip. 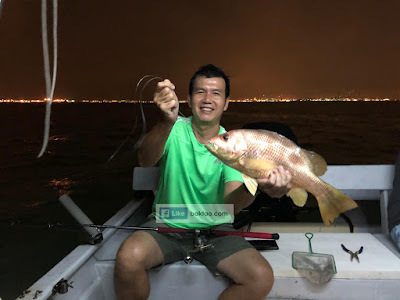 We weren’t rusty though and Abang didn’t disappoint with his astute as always attitude towards night fishing. It simply was a matter of letting time pass (and the fish to get on the bite) when we’re with him. 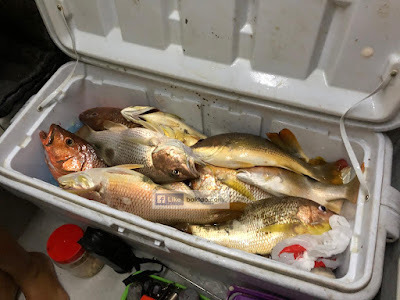 We were the opposite of unlucky that night though and we scored some very decent golden snappers (ang chors) and deep sea mangrove jacks. Chin, who was a first timer to night offshores, caught a pretty decent deep sea mangrove jack and we were all pretty jealous (especially when he didn’t know how rare it was). 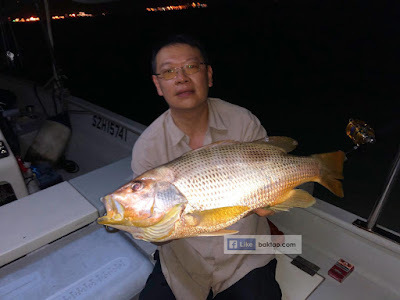 The biggest ang chor was around 4kg by Biao and that really gave him a good run for his money on his Penn 12T. Joshua too was having the time of his life with the trip being one of his most successful ones for the time being. Grown men (yours included) were pretty much reduced to moaning when the snappers hit us. All of us managed at least 3 to 4 pieces of good fish. We even had the luxury of letting a few go either through hooks coming off or bust lines. 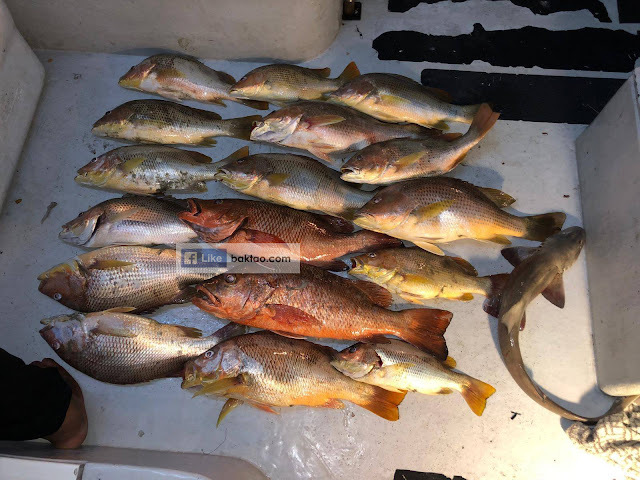 The frenzy lasted an hour or so gave us 15 pieces of assorted snappers of mixed sizes (mostly at the 1.5kg to 3kg range) and we picked up another 3 pieces of snapper on the way back to RSYC. Chin scores his first decent sized chor! Biao posing with the MJ. Hehe! We reached land just as the rains were about to have a go at us and this reminded me yet again of the legend of Abang (heck, this guy is a fish and rain machine; Abang told us rain coming, better go). 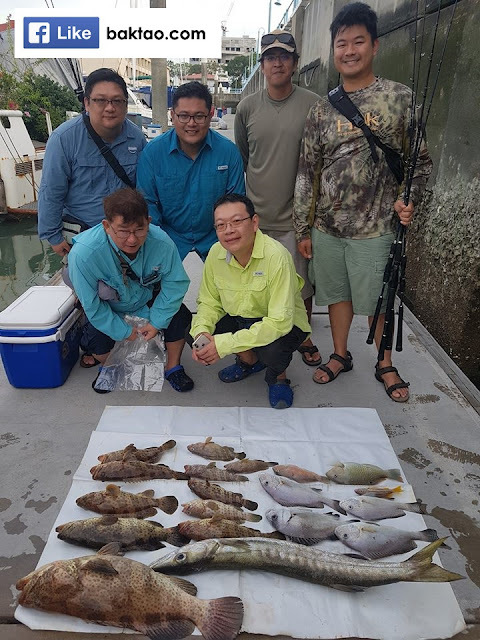 Really decent haul for Singapore waters! Fishing in Singapore dead? Nah, that’s something that we want everyone to think. 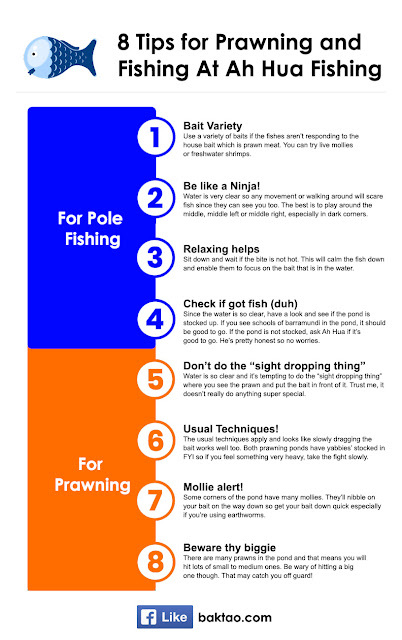 I’ve always loved pole fishing ever since I tried it years ago at Pasir Ris Pro fishing pond (PRPP). 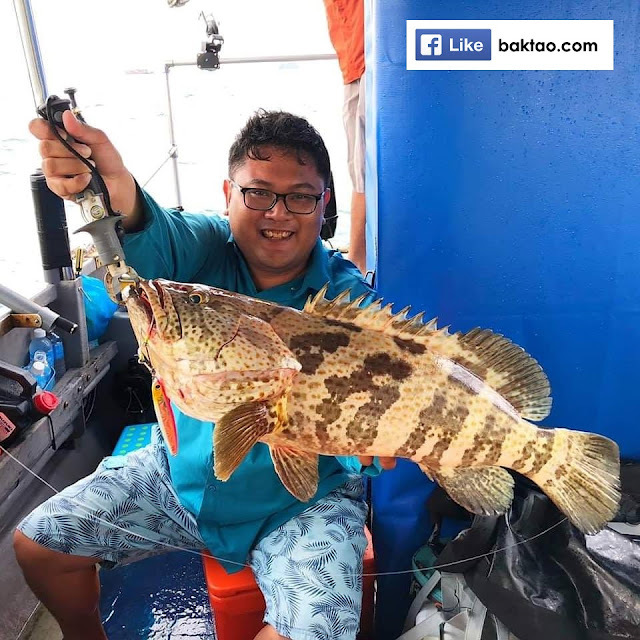 Back then at the pole fishing pond, they stocked golden pomfret (kim chio), snappers, groupers, red drum (taiwan ngor) and even barramundi (KBL). So, when I heard that Ah Hua Fishing has a catch and keep pole fishing pond, I knew I just had to go and see for myself. It just took a few minutes to gather some kakis and we visited one weekday afternoon. In my heart, I knew, “where got so easy to land a lot of fishes one…”. But I suppose we convinced ourselves that even if have no fish, we could also do some prawning and have a good prawn BBQ dinner. So fast forward to the trip… the first thing that we noticed when we arrived at Ah Hua Fishing and Prawning pond was that the water was crystal clear! We could see the fishes in the fishing pond clearly and even count how many there were. Likewise, for the prawning pond, we could see orange yabbies’, blue yabbies’ and blue mountain prawns all crawling around below. Well, I don’t know if it’s going to be this clear but clear water always signals that the pond operator/owner (Ah Hua) has nothing to hide since it would be pretty clear if there are fishes or prawns in the pond just by looking around. Biao and David quickly collected the fishing rods from Ah Hua at the counter and we went to the fishing pond. We could see barramundi, patin, pacu, tilapia (black and red) in the pond and I suppose we were a little too complacent since we could see them. Even as I was filming, I expected bites instantly but that was not the case. Bites were hard to come by and the fishes were very smart and avoided our baits. That was when we sat down and just watched our floaters. Oddly though, that was when the bite rates improved. Biao and David managed to get a few tilapias in quick succession and hooked up with a couple of barramundis (we only landed one for dinner eventually). Oh well, I would have given anything to see them battle the huge patin and pacu in the pond! Still good fun though. After fishing, we moved on to the prawning ponds and were pleasantly surprised that it was quite productive. The average time to get one prawn was definitely less than fie minutes. Take note that there are yabbies’ in the pond though. One thing I can tell you though that do not try the “spot the prawn and drop the bait there” thing. It didn’t really work at all and the prawns wouldn’t be interested. The usual techniques still work well. After prawning, we then went to prepare the fish and some of the prawns for dinner. One observation was that the prawns here looked clean and vibrant. Experienced prawning folks will know – the bright colours on the prawns and bright orange/red/blue hues told us that the prawns were very health and I was not squeamish about eating them. The star of the show though, was the freshwater barramundi (KBL). It was a little unbelievable because it tasted as good or better than seawater ones. Of course, we had good seasoning with a mix of herbs (dill, garlic powder, salt, black pepper) and lemon for the BBQ but it was really sweet and the flesh was fairly firm (not the “hu-hu” kind of flesh that you expect from such fishes). It will probably also taste good if we foiled it up, added some ginger, soy sauce, Chinese wine and BBQ-steam the fish. That brings us to the conclusion of our visit there. I’ve appended some tips in point form and all the other information that you may need before heading there. The verdict on Ah Hua Fishing and Prawning? Well, I’d definitely go there again! Use a variety of baits if the fishes aren’t responding to the house bait which is prawn meat. You can try live mollies or freshwater shrimps. Water is very clear so any movement or walking around will scare fish since they can see you too. The best is to play around the middle, middle left or middle right, especially in dark corners. Be tactful! Sit down and wait if the bite is not hot. This will calm the fish down and enable them to focus on the bait that is in the water. Since the water is so clear, have a look and see if the pond is stocked up. If you see schools of barramundi in the pond, it should be good to go. Water is super clear but doing the see prawn here and put bait there really doesn’t do anything special. Save your energy better. The usual techniques apply and looks like slowly dragging the bait works well too. Both prawning ponds have yabbies’ stocked in FYI so if you feel something very heavy, take the fight slowly and also read this tip. Some corners of the pond have many mollies. They’ll nibble on your bait on the way down (especially if your'e using worms) so get your bait down quick. There are many prawns in the pond and that means you will hit lots of small to medium ones. Be wary of hitting a big one though. That may catch you off guard! Need more tips? Read Basic Introduction to Prawning: Simple Tips and Tricks. Fish feeding of koi (they allow hand feeding and the pond is stocked with lots of koi) through handfed milk bottles. Very different from just throwing the fish feed and looking since there’s an element of touch involved. Quite a novel way of providing a child with the experience of touch. Longkang fishing. This is a little small since it’s just a rectangular enlarged tank but seems more hygienic or safe since your child doesn’t need to like wade or stand around water. Corporate bookings for teambuilding purposes for the prawning ponds. Prices are very competitive and there are some team building games built into the packages. If you drive, parking is per entry and there is an hourly charge. We can’t remember the hourly one but it’s $3.50 per entry. Note prawning cost is 1 hour $20, 3 hours $36 or $100 for 10 hours (limited to 2 rods per card). Fishing cost is 1 hour $25, additional hours $15. Koi feeding is 1 bottle/pack at $1. Note by author: The fishing and prawning bite rates were not rigged in any way. We used the house bait they provided and the operator also did not release dozens of fish or kilograms of prawns for us. 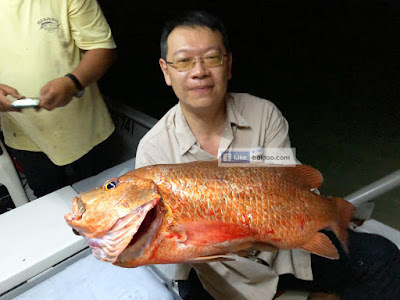 In other words, this catch report is not a kelong and bluff people one although we did seek Ah Hua’s permission to film the fun and work together for a giveaway contest.